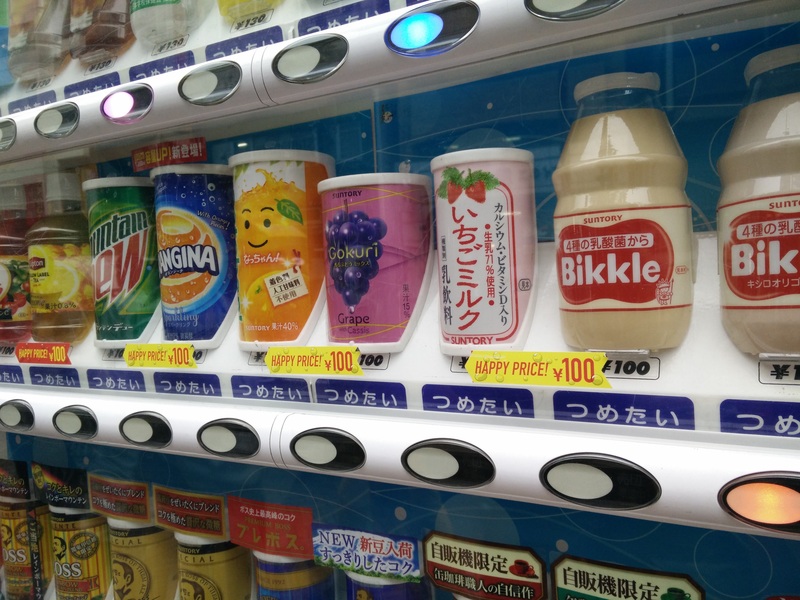 I’ve kept hearing all about Tokyo’s vending machines, and in particular, soft drink vending machines. 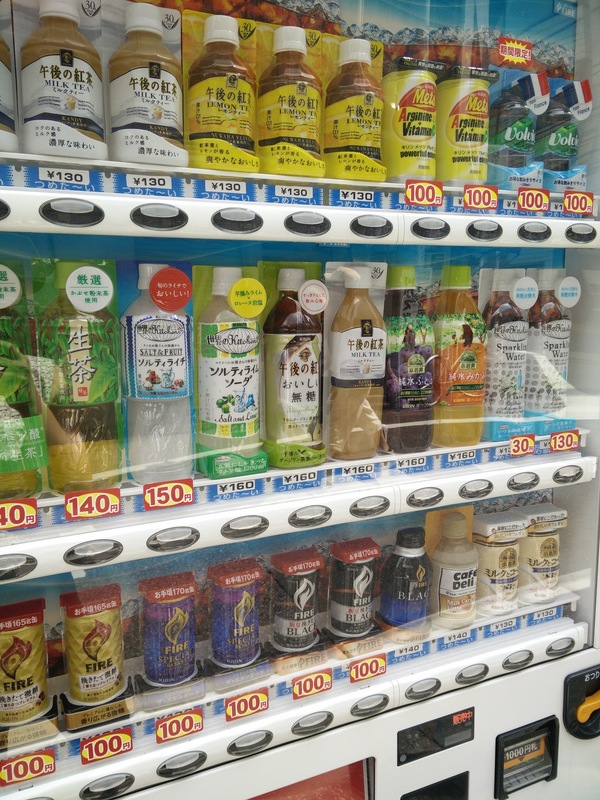 Coming to Japan, I felt like I’m on a mission to gamble and try a different drink each day of my vacation in Tokyo. 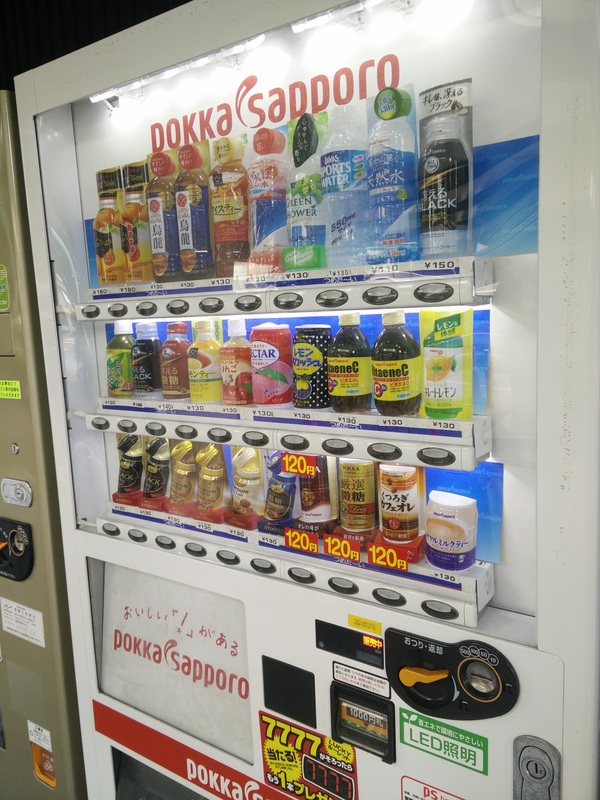 These vending machines are literally everywhere – you can find them on every street corner, which is just perfect for tourists who cover long distances. 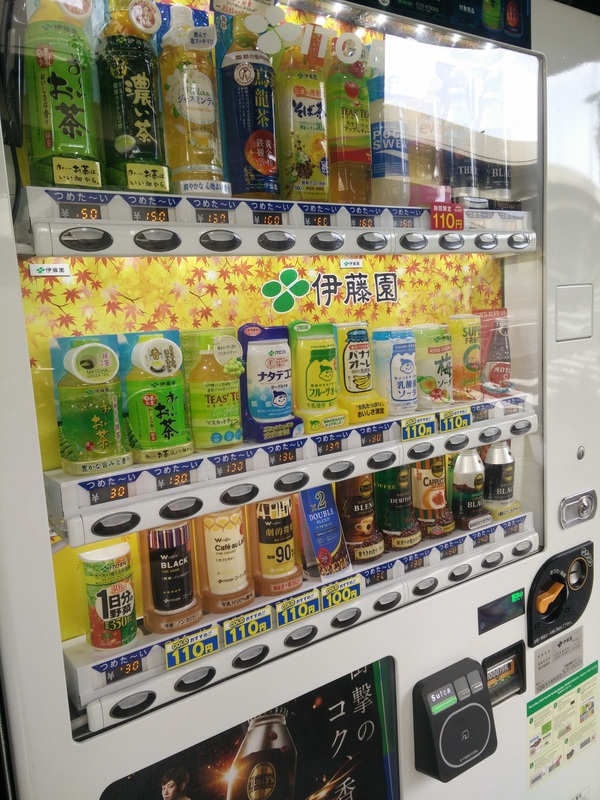 Each machine is different, as there are many brands and endless drinks. 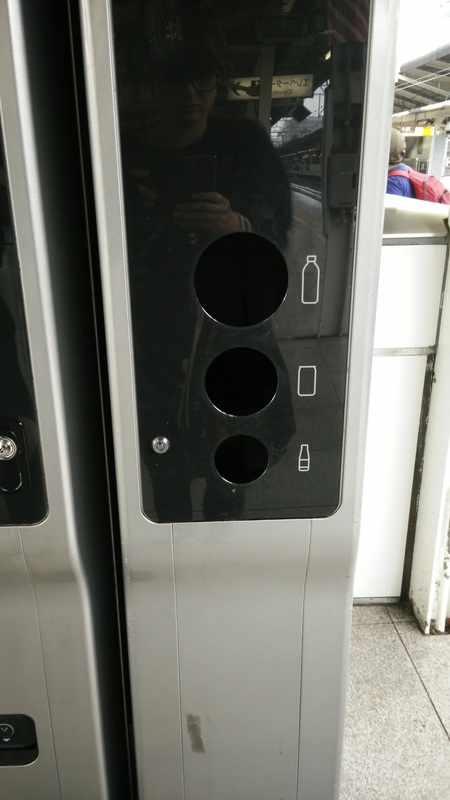 The nice thing is that even in Coca Cola machines, for example, you wouldn’t find only the regular suspects, but also a large variety of Coca Cola drinks aimed for Asian audiences. 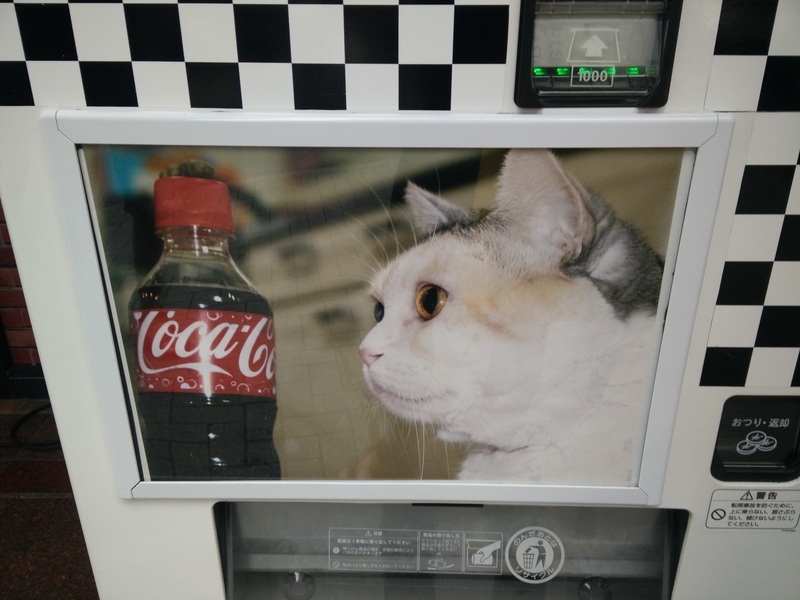 Some vending machines boast a fierce staring competition between a cat and a coca cola bottle. 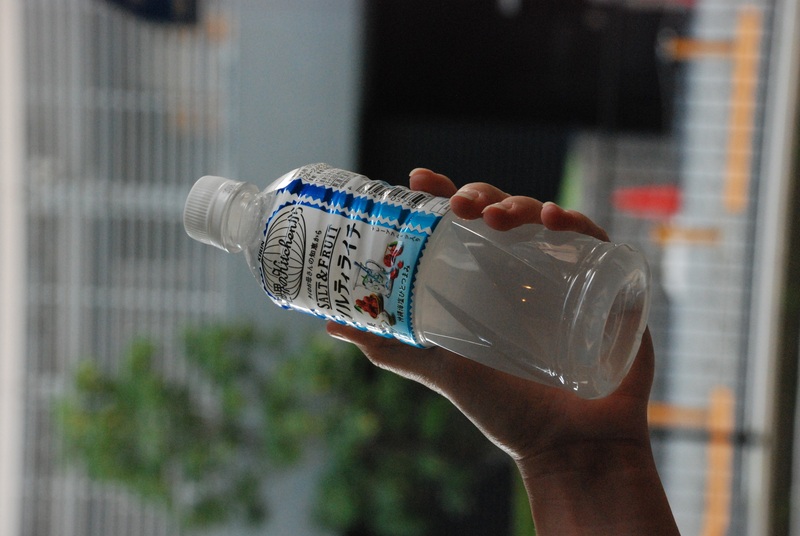 Didn’t you always wanted to taste bottled sweat? 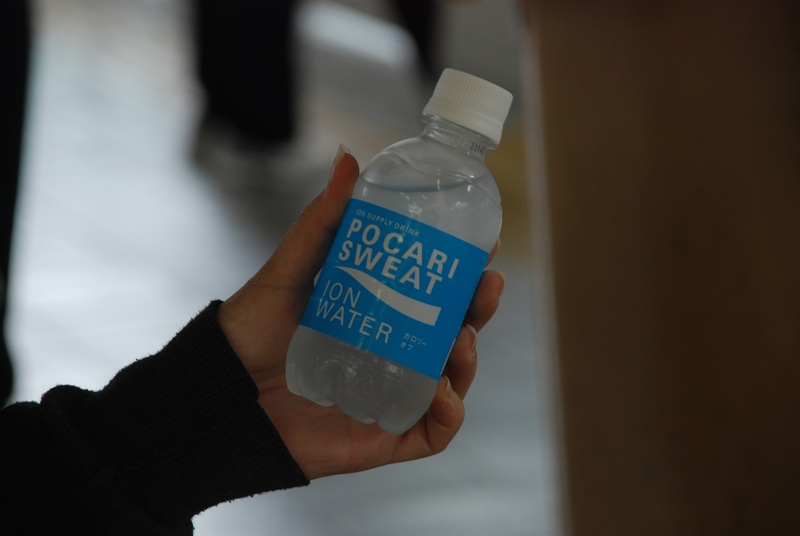 Pocari Sweat is a sport drink, that has a mild grapefruit flavor. 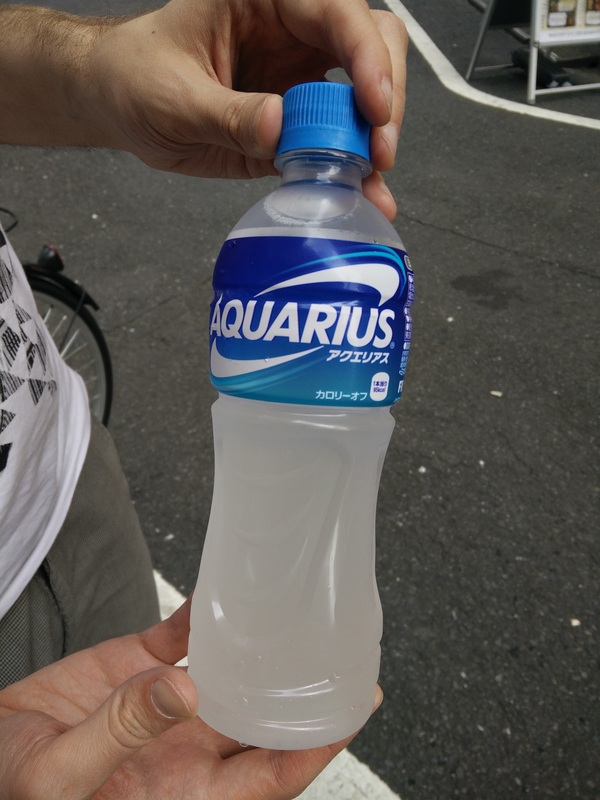 Despite the off-putting name, this one was kind of nice and refreshing. Acerola drink “with vitamin c for your healthy life”. Acerola is a tropical fruit and turns out this little berry is full of natural vitamin C and some more healthy goodies. Flavor-wise I was certain this is mango juice, until looking online. 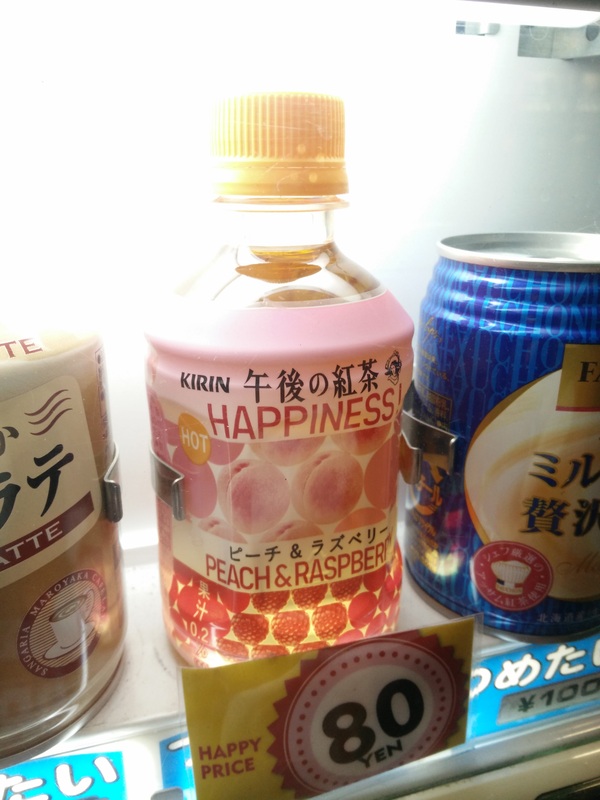 This one, as opposed to many other drinks, had no English\image hints whatsoever so I felt like I’m truly gambling this time – Nils Holgersson flavored soft drink? Possible. 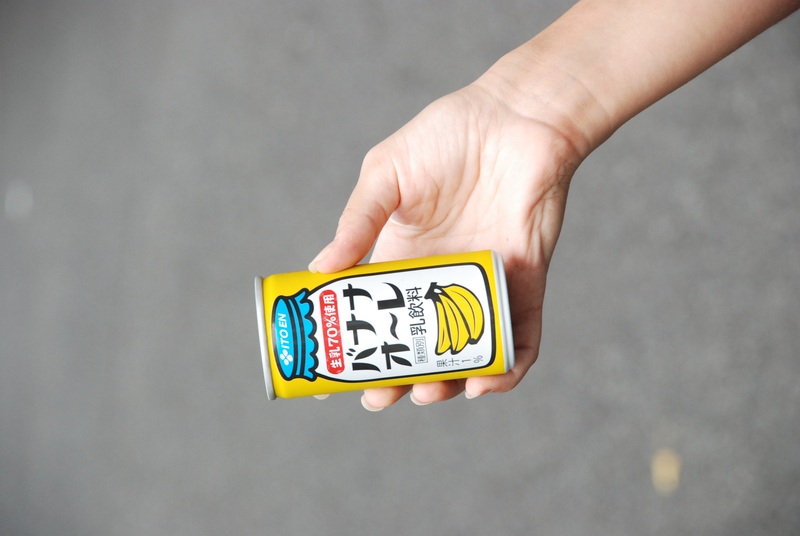 This is a cute white grapes, bananas and mango juice by a company called Chichiyasu. Sadly no Nils Holgersson. 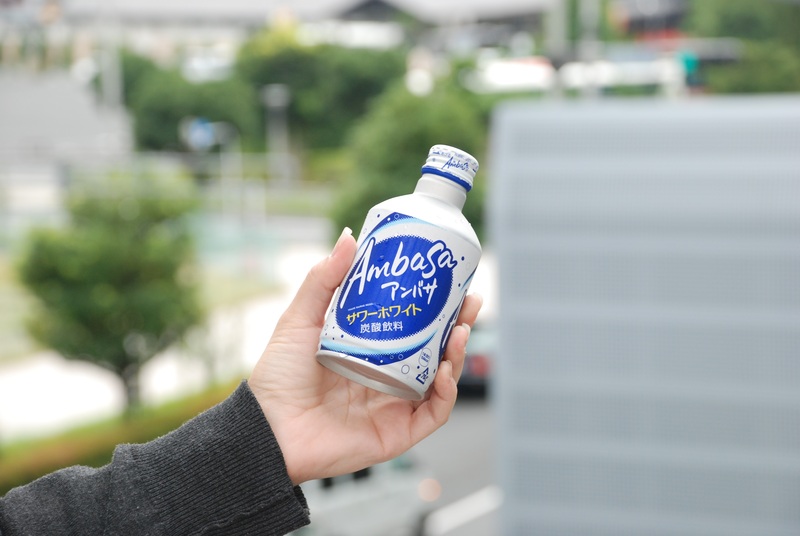 In Odaiba I tried Ambasa, a milk soda, which comes in an aluminum bottle. 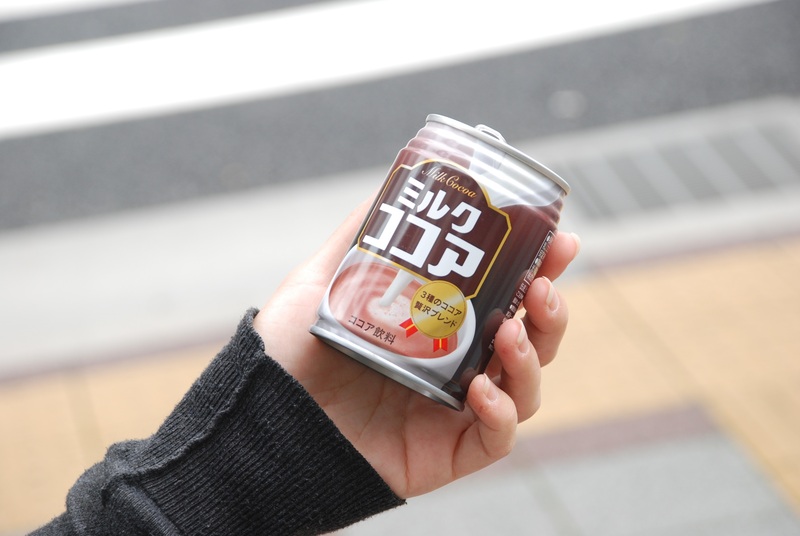 It was quite interesting drinking a carbonated milk beverage but the taste was actually quite good – very sweet with strong hints of vanilla. Definitely one of my faves. 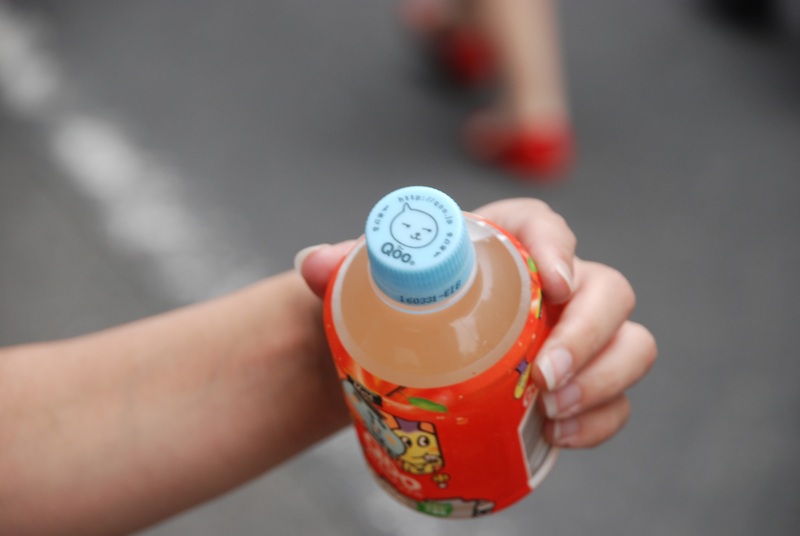 Next one is packaged in the most Kawaii bottles I’ve seen. This is a non-carbonated beverage from Coca Cola. It comes in different flavors, and this, if I’m not mistaken, was pear-flavored. 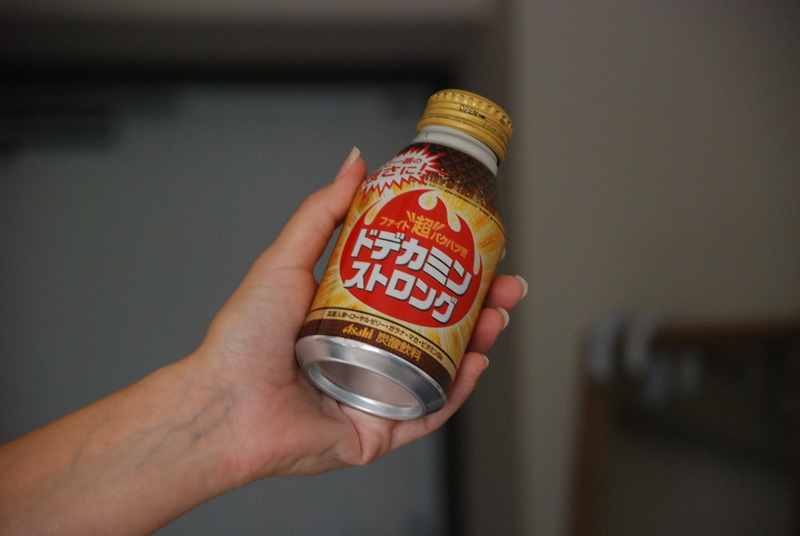 Dodekamin Strong by Asahi is obviously an energy drink by the looks of it. Naturally I expected its flavor spectrum to be somewhere between yucky medicine and pure sugar. Of course I had to try it. The taste was somewhere in-between but not something I would buy again. When wanting to be on the safe side, it’s always easy to just grab some bottle with a huge picture of some kind of fruit on it. 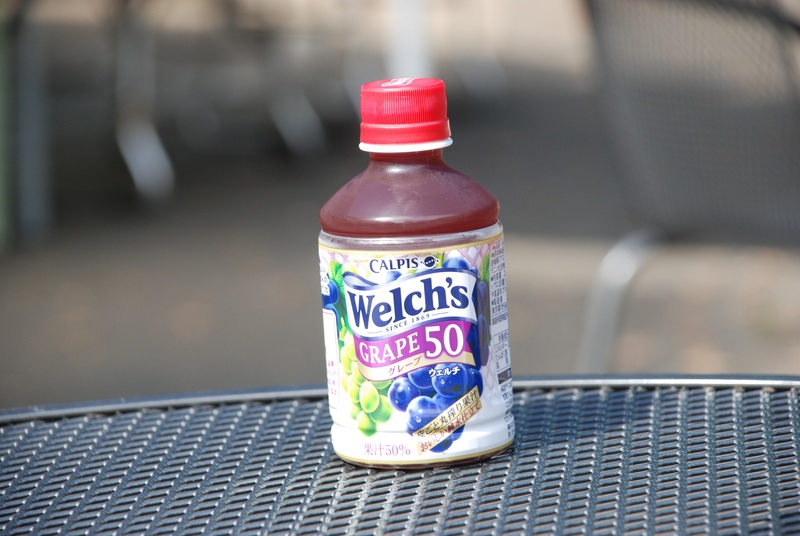 This grape juice is by an American company, known for their grapes. 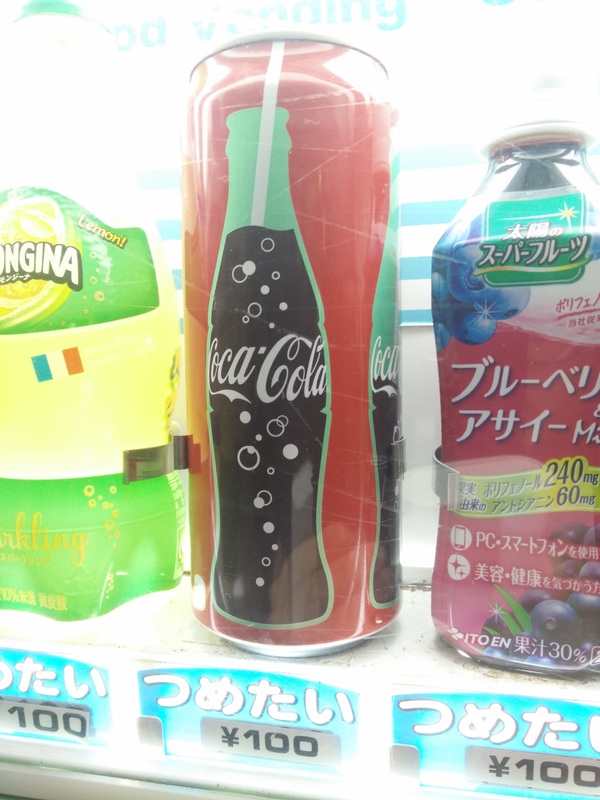 Nothing special – carbonated grape popsicle flavored drink.. This one intrigued me from the moment I saw it – Salt & Fruit beverage. Salt? why not, I’ve always been a fan of sweet and salty mix. 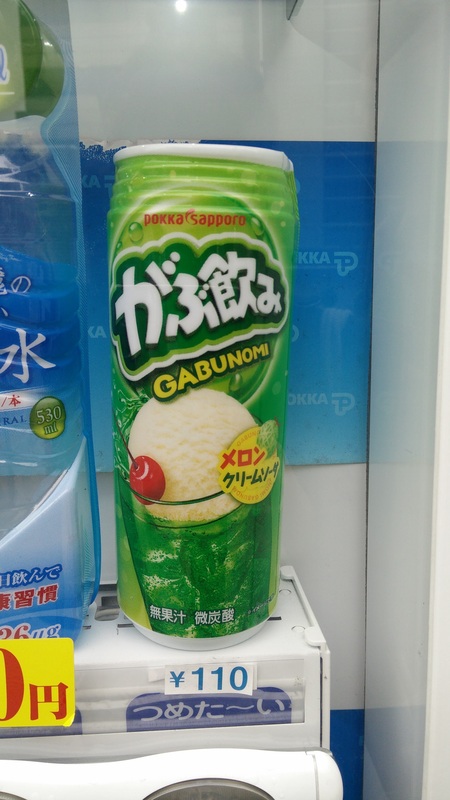 They also sell various flavors but the one I stumbled upon was lychee and mint. Unfortunately, the mint kind of took over so the lychee was not apparent. This following drink, looks like it spelled Kebab in Hebrew, was nothing fancy. Just regular chocolate milk. 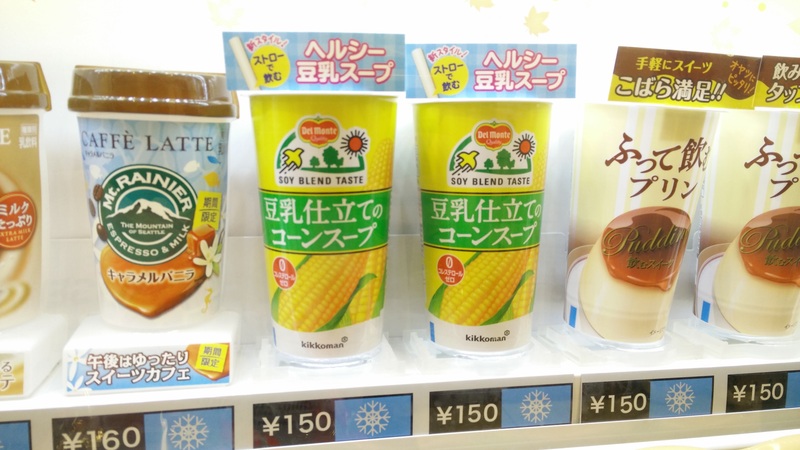 I also tried a banana milk using milk from Hokkaido. Kind of reminded me the banana shakes we have at home. Dying of thirst Opher really wanted a bottle of water. What do you think he got? Not water that’s for sure. 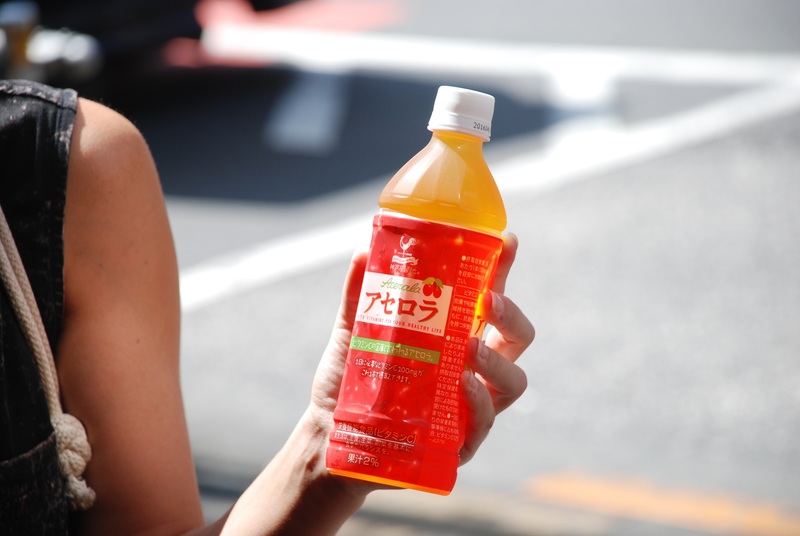 The citrus flavored carbonated sport drink is also by Coca Cola. I really liked it. 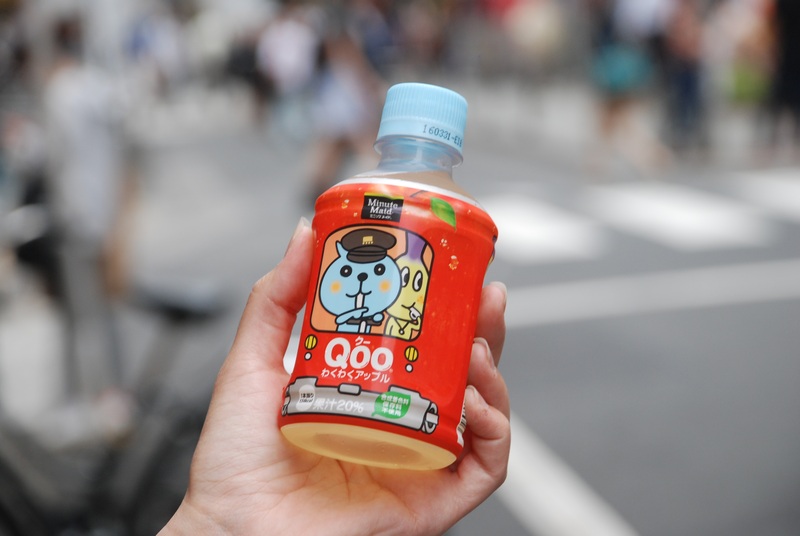 Gogo no kocha (Afternoon tea) Milk tea is a strong black tea partnered with milk and sugar. 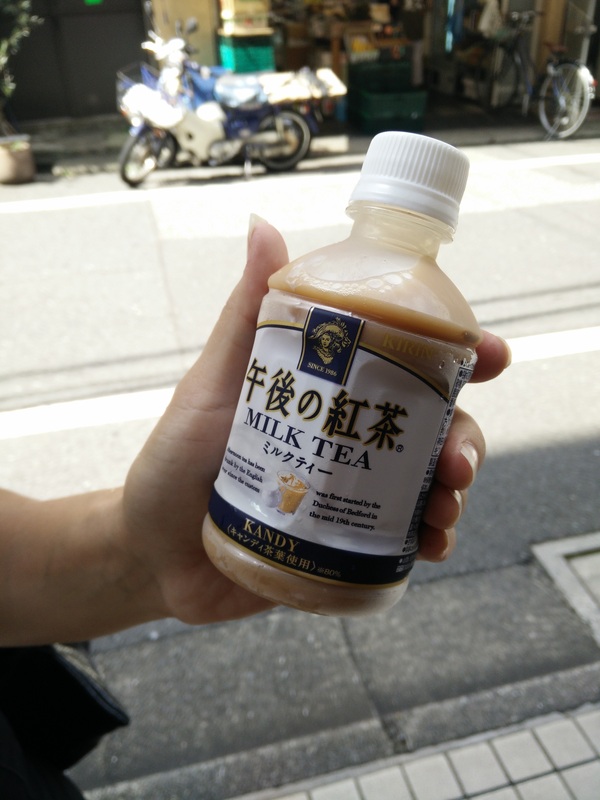 I thought I would really like Japan’s milk tea and planned on tasting a few of them. Turns out I was wrong. This was my last milk tea. 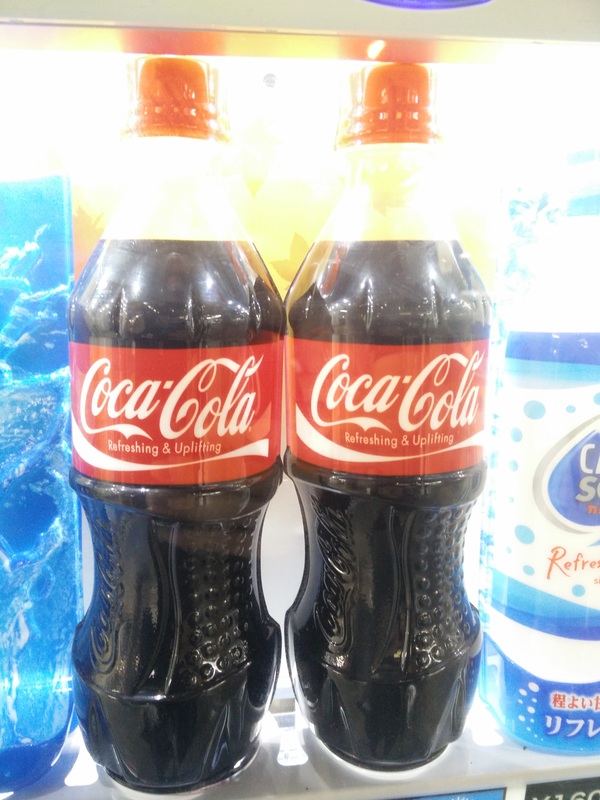 Don’t you just love it when your Coca Cola beverage is both Refreshing & Uplifting? 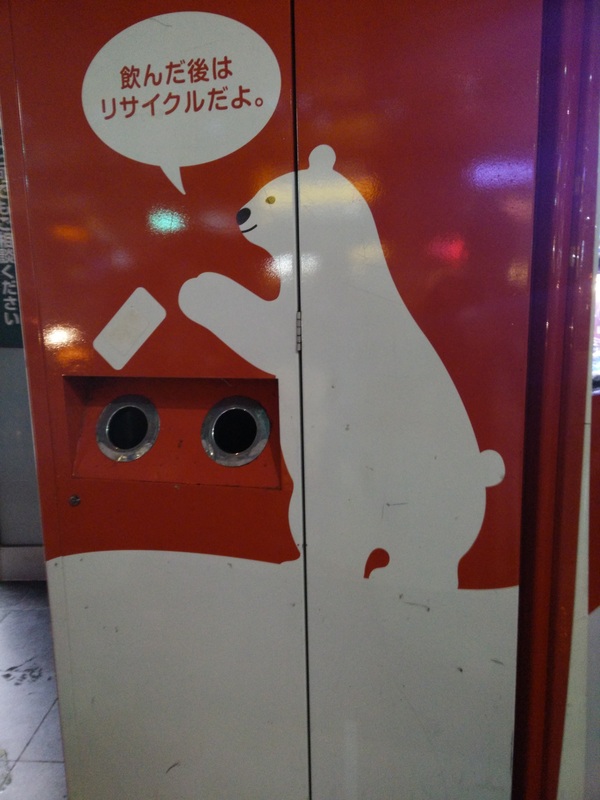 Learn from the Coca Cola bear and drop your cans in the recycling holes. Coca Cola glass bottle in a can costume. Goldilocks would probably be very bad at recycling. 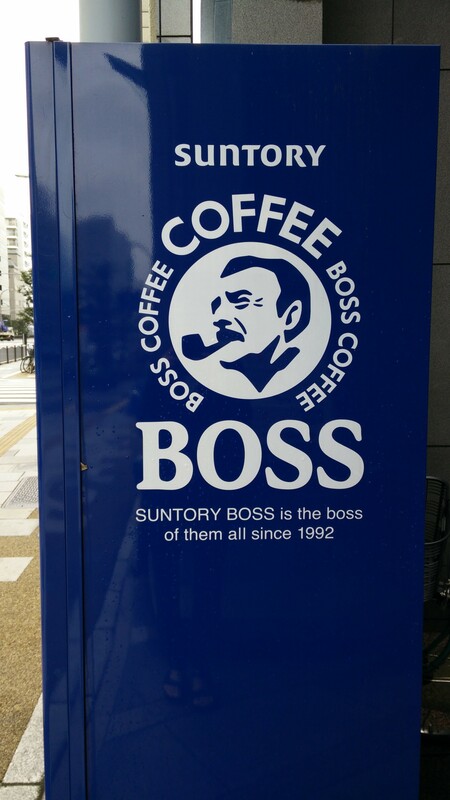 SUNTORY BOSS is the boss of them all since 1992. Bruce Springsteen would disagree. 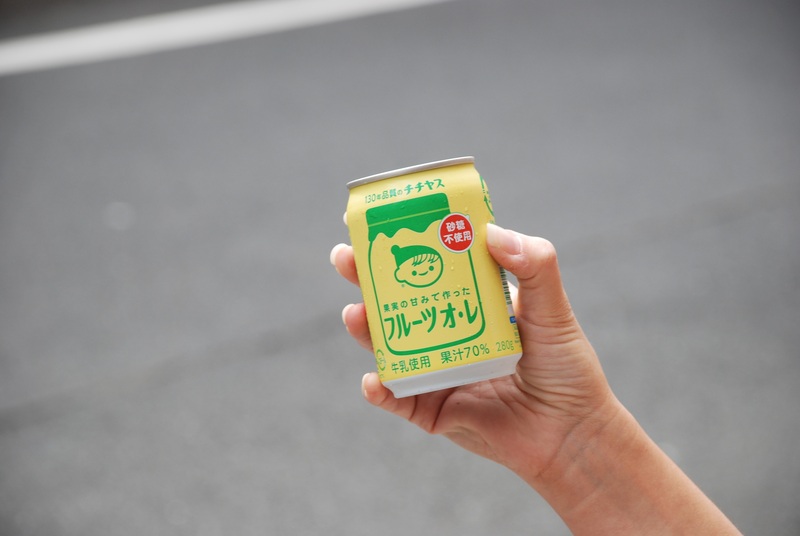 Melon Cream Soda. Is the ice cream and cherry included?